Every spring, Gift of Life honors donors, recipients, volunteers and supporters at Celebrating Life events across the United States. Celebrating Life Los Angeles was held on Thursday, March 7, 2019, with more than 300 people gathering to share in the festivities and show their appreciation. The event was hosted by the Celebrating Life Committee. Scott Gray, 49, (above, left) is having his second chance at life. In 2014, soon after retiring from the U.S. Marines where he served as a Master Gunnery Sergeant, he began feeling constant pain in his tailbone. The diagnosis was shocking: acute lymphoblastic leukemia. He would need a stem cell transplant to survive. Scott’s first impulse was to talk to his brother Daniel, who had battled leukemia in his early teens. But, he knew that although his brother was a perfect match, he would not be able to donate due to that past bout with blood cancer. The transplant center had already moved forward with an unrelated donor search, and found his perfect match in Gift of Life’s registry. On Veterans Day 2014, Scott had his first stem cell transplant at UNC Chapel Hill, with his wife Nicole at his side. He had a second stem cell infusion in 2018, and when he got the invitation to meet his donor at Celebrating Life, he was excited for the opportunity. That generous donor is Abraham Zilka, 37, (above, right) who lives in Beverly Hills with his wife and two children and works in a financial services firm. He swabbed in January 2005 while on his Birthright trip to Israel. “Donating stem cells is one of the most meaningful experiences of my life, one I will be proud to share with my children and grandchildren,” said Abraham. 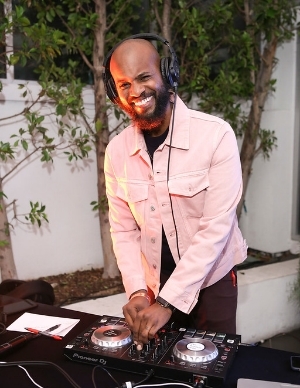 The two were introduced by marrow transplant survivor and founder of The Mission Entertainment, Andrew Coles, who also served as the event’s DJ. Emotions were high as the two men hugged and shared their feelings with everyone in the room. The two men are looking forward to a lifelong friendship between them and their families. “We live in a world where everyone is telling us how divided we are, how separate we are, screaming how polarized we are, but if we can take a minute to realize how similar and connected we are, this would be a much better place,” said Abraham. 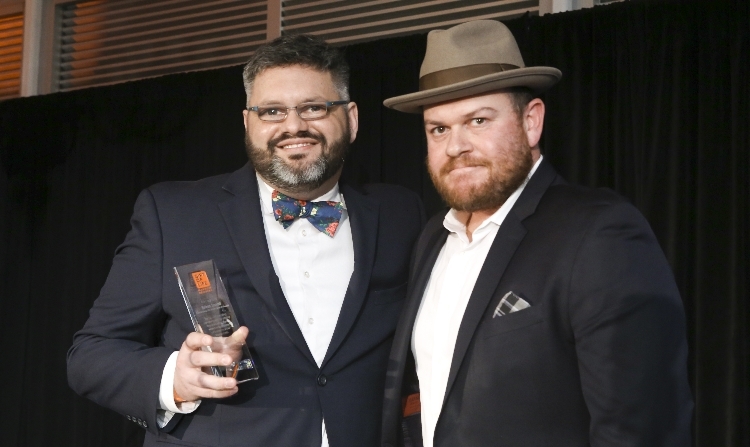 Gift of Life was proud to honor Brian Small with the Adam Krief z″l Celebrating Life Award, presented by the 2018 recipient, Jeremie Braun. The award is presented annually to a Gift of Life supporter who has had a significant impact through running swab drives and adding new donors to the registry. Brian is Assistant Director of Hillel at Vanderbilt University, and has actively advocated for Gift of Life by running drives on campuses for many years at Vanderbilt and other universities. In October 2018, Brian spearheaded the Vanderbilt Mega-Drive, swabbing 866 people. He formerly served with Hillel at Syracuse University, where he swabbed more than 2,000 students resulting in 15 lifesaving transplants to date. 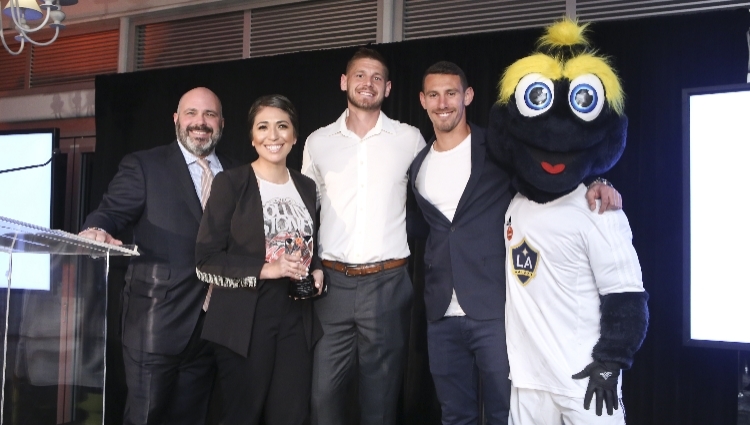 The L.A. Galaxy Foundation gives Gift of Life the amazing opportunity to share our mission with their fans each year during Major League Soccer’s Childhood Cancer Awareness month. Together our two organizations hold events, including Kick Blood Cancer, a kid’s outdoor soccer-focused event. In September 2018, the Galaxy hosted an incredibly special donor-recipient meeting on the soccer pitch during a game: former Gift of Life Campus Ambassador Aaron Allen met the 11-year-old boy he donated bone marrow to save, Seth Akins. Click here to watch the video of Aaron and Seth's introduction. Providing music for the evening was professor X, the stage name of Andrew Coles, producer, curator, activist, DJ and founder of The Mission Entertainment. Andrew was given the honor of introducing Abraham and Scott, and told his own story of battling leukemia as a teen and surviving thanks to a marrow transplant. Thank you professor X for supporting our mission, and helping to spread the message about the crucial need for donors of diverse genetic heritage to join the registry. To view event photographs, click here. To watch the event video, click here. To join one of our Young Professionals Committee chapters in Boston, Chicago, Los Angeles, New York, Orange County, San Francisco and South Florida, visit our Young Professionals Committee sign up page. If you’d like to help add new donors to the registry and give hope to those battling blood cancer, please give to the Celebrating Life Los Angeles Donor Circle.